 Public Lab: Duty Cycles & 555s --> linearity! When I mentioned to Mark that we're trying to use a 555 to measure conductivity, he had a lot of useful things to say, and one of them was to point out that the way we'd hooked up the circuit, the 'duty cycle' of the 555 output square wave isn't '50%'. That sounds fairly technical. What does it mean? 'Duty cycle' is the amount of time that the oscillating circuit output spend in the 'on' vs the 'off' state -- there's a great explanation of it on Wikipedia, here. Note: most of the graphics I'm showing later in this note derive from a wonderful online explanation of duty cycles and the 555 timer, learnabout-electronics. For the 50% duty cycle above, you can see that the output spends the same amount of time on as it does off. The amount of 'on' time vs 'off' time isn't the same -- it's not a 50% duty cycle. This isn't ideal for what we want to do (measure conductivity), because it means that the electrical current flow through the water isn't unbiased: for every second that the circuit is turned on, there's a longer current flow in one direction than there is in the other, which could result in polarizing the water sample (and more corrosion on electrodes). Worse, the amount of bias is a function of conductivity / frequency, so the amount of bias will change depending on the sample's conductivity. The conductivity, S = cell_constant / R, where the cell_constant comes from the particular metal and geometry of the conductivity probe (e.g., the screws, and their spacing, in the bottle cap. 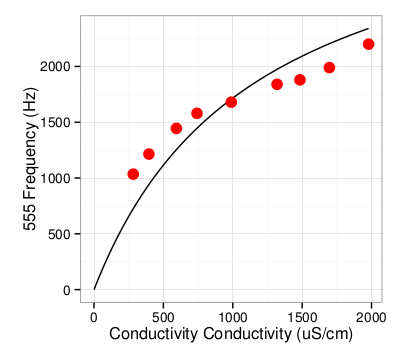 A simple, linear relationship between frequency and conductivity, where the slope is .7/C -- wow! Where 'm' is equal to .7/C, with C being the capacitor we use in the circuit. Simple! This means that the output of our 555 circuit is far easier to intepret. A plot of frequency vs conductivity will yield a straight line. And the circuit is very easy to tune in range -- the slope is .7/C, so if we want to keep our frequency values in a certain range (audio, say), we see how to change our capacitor value accordingly. For example: larger R_water in the denominator will mean that the frequencies go down; to bring them back up, we can use smaller C in the denominator. This is nice! EDIT: This idea below doesn't work, because: math. See the comment section for a calibration idea involving a trimmer capacitor that should work! The difference between DIY probes will show up in R_water; by tuning R_tune, we can compensate for these differences. NEAT! This is great news!!! And well presented! YES! :) I was dancing around with glee last night when I saw the equation for freq vs. resistance and capacitance for the 50% duty cycle! this is super excellent. does this mean that people can assemble DIY probes with slightly different relationships that we can now tune to standard saline solutions? does this eliminate the need to manufacture a precise probe? Yes! And before, when we had a different relationship between freq and conductivity, the only way to do that tuning was to tweak the probe -- and Jeff W had a great idea re: e.g. placing probes on a ruler, and tweaking. But now, we can just add a potentiometer to the circuit, and tune the frequency output of a standard saline solution (contact lens / Perrier / etc) to match -- done. Woohoo! So, we replace C in the equation with a trimmer ... and then everything will scale accordingly! My endocrine system can't handle all of these ups and downs. But tonight ends on an up. The trick will be figuring out what range is needed. 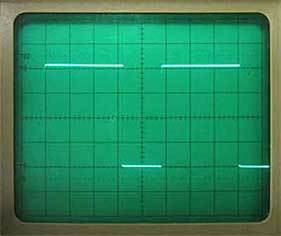 We can probably do this by building a few DIY probes with a given value of the capacitor C, place them in some standard solution (contact lens solution, say), and seeing how much the frequency changes across changes in geometry and probe material. This will lead to a sort of estimated change in frequency that we need to account for in terms of a change in the capacitor value. Excited to try this! Your diligence in solving this calibration problem in the most user-friendly way that ALSO involves simplifying the electronics AND the signal output makes me ecstatic. Aw, shucks :) But yes, it's so cool that we might find some part of design solution space that satisfies all of these! Before Ben pointing me to trimmer capacitors, though, I did start to feel that it was actually pretty cool, as per Jeff's idea, to have electrodes on a ruler -- so that the user gets a sense for which physical parameters affect the conductivity measurement (the distance between the electrodes in the water being one of them). Turning a capacitor knob isn't as directly intuitive ... but it still leads down a path to understanding the "RC" part of the oscillatory circuit, and there's no reason we can't also do the 'electrode on ruler' idea, too. In fact, maybe: first you place the electrodes (screws from the hardware store, fixed with paperclips, as per Jeff's idea) on a ruler, changing their separation until you get into the right frequency ballpark; and then you use this separation distance when placing the screws in e.g. a plastic bottle cap (for rigidity / stability), and use the capacitor trimmer for fine tuning. It'd be pretty rad if doing things in this way, and generating audio frequencies that get sampled on a smartphone / laptop, leads to a more sensitive and reliable instrument than $40 or even $150 conductivity probes on the market. And those probes don't support 'data logging', whereas we just need to record the audio file (which you and Jeff have pointed out repeatedly). AND the data is directly intuitive, when calibrated against a standard tone -- "middle C" is always 1200 uS/cm, say. This is going to be so cool. Chris suggested at LEAFFEST that we write up all of the 'benefits' of using audio, and the resistance --> frequency setup, for folks who haven't been privvy to all of our mad brainstorming around this. Let's do that in a wiki / etherpad soon? yes. we should. It isn't directly evident why we would use audio, given that it is so incredibly data-intensive. We have to make that argument RE:legibility of data, simplicity of processing, intuitive understanding of function vs. Taking up tons of space on a hard drive. changing the capacitance is really easy to explain to people. every transition from a peak to trough of the wave form is queued in by the filling of the capacitor. So getting a longer or shorter wavelength depends on adjusting the "depth" to which the capacitor gets filled. Its like adjusting the height of a toilet float in the flush tank so it fills faster/ flushes less. Oh, toilet tank analogy is great! @cversek was talking at LEAFFEST about how, in the water <--> electricity analogy, the only sticking point is capacitance. He was suggesting the idea of a rubber bladder. Toilet tank is great, too.